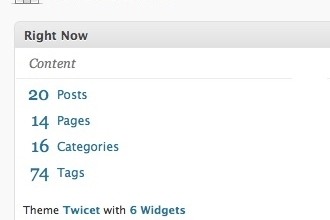 If you’re like me and have realized the impressive power of WordPress, whether as a CMS or just simply a blog, then you’re probably quite familiar with the frequent WordPress update notifications in your dashboard. And probably also like me, you’re zealous about always being up-to-date and taking advantage of the latest featured and newfangled functions. because your theme might not support the new version yet. Before upgrading to the latest and greatest WordPress update, you’ll want to check in with the WordPress theme author for compatibility before you go and make the leap. Question: How do I know what version of WordPress I’m currently using? See? It's right here! In the top left corner. Answer: The answer is right under your nose! 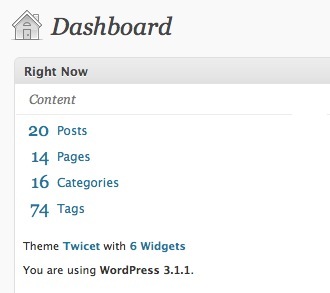 Simply login to your WordPress admin dashboard (in most cases, located at yourspecificsitedomain.com/wp-admin) and it’ll be displayed in the upper section of the dashboard home page. Don’t worry… You’re not alone. I overlooked this for years. Sometimes we just like to over-complicate things for ourselves, don’t we? If you’re looking for assistance with your WordPress based website or perhaps a brand new web design in Redding, California – please feel free to contact me using my easy contact form!